First of all, I want to say a huge THANK YOU to everyone for being supportive of me after my little freak-out last post. I had a bit of an irrational moment of self-doubt, nothing a bit of venting and good friends couldn't fix. One of my uni friends who read my last post got in touch with me last night and we had a good conversation about writing. We discussed how we subconsciously put parts of ourselves, including our experiences, opinions, emotions, and even our personalities, into our writing and our characters. Once I thought about it, I was a little shocked by how much of myself I'd revealed in WALLS. Of course, WALLS is a work of fiction, and I didn't deliberately put in those pieces of myself. Only people who know me really well would be able to find all the similarities. There are some obvious things. For example, after reading the first chapter my friend said he could see a lot of me in the character Mildred. I'm not entirely sure how to take that, because I think Mildred is a bit of a nasty b-word in that first chapter... but I get where my friend is coming from in a sense (does that make any sense?). A part of the conversation was discussing why my world-building might have been hindered while writing the first draft and I think we came up with some good theories: why I'm writing; the emotion(s) I'm writing from; and who I'm writing for. I have been writing with mid-late teen characters, because I relate to them easily. I fit into that age bracket and I know what sort of things happen to them and go through their heads, and I'm surrounded by others of that age who give me examples outside of myself. I write a lot of teenage angst, because I know it and want people to understand it and how to deal with it, even if I'm using fictional characters and circumstances. Therefore, I sometimes write from unstable emotions, even though I'm writing fiction. In a first draft, my focus is on the characters rather than their world and I tell myself I can come back to correct the imbalance later. Realising the seriousness of that imbalance is probably what stressed me out and made me doubt myself. Now it's a matter of being rational and distancing myself from the initial emotional splurg of a first draft to look at the writing objectively. As for who I'm writing for, it hasn't been for myself very often lately. NaNo'13 was probably the first time I've written for myself in a long while, because I've otherwise been writing for uni assignments (workshop classmates and tutors), Deakin publication opportunities, or for people on my blog. In those circumstances, I hold back and cut myself short to stop things from getting too long or sounding ridiculously unprofessional and overemotional. I've become so used to writing to a formula that the idea of writing for myself without one, or at least without the formula I'm used to, left me feeling a little in-over-my-head when I got to the end of that first draft and realised how much needed fixing. It's only a first draft and it doesn't matter if the world-building wasn't top-notch from the first word. Everything that needs fixing can be fixed in re-drafts and I shouldn't worry so much about everything and doubt myself. I wrote a novel, a first draft of over 88,000 words, in less than 40 days. That's an achievement. If I can do that much, I can make it the rest of the way. Have you ever subconsciously included something real and personal in your writing? Why do you write? What emotions do you write from? Who do you write for? I've spent the past couple of weeks starting to edit the first draft of my NaNoWriMo project 'WALLS' and it's been a bit crazy. I have had an amazing amount of support from friends on Facebook and especially people I know from uni who have been reading the first chapter or two for me and giving me some really helpful feedback. Those people know who they are, but I want them to know how appreciative I am of their help. My goal at the moment is to make sure my opening chapter is as strong as I can make it and at the moment I need to work on my world building, not only in the first chapter, but throughout the whole story. I'm trying to pay a little more attention to the world building in George R.R. Martin's A Song of Ice and Fire books while I read them (just under 200 pages into Clash of Kings). The world I am creating is very different to the one he has created, but the way he has created his is so phenomenal that I'm sure paying attention to the craft will be worth my while, especially since a couple of my friends who have read the first chapter or two have said they want to get a better feel of the setting. One really good comment a friend made was that I should be able to communicate my setting through the everyday life of my characters. My main character, Mildred, is a refugee in a city surrounded by a wall that was erected to keep the citizens safe from the dangers on the outside, but the City itself is controlled by an invisible figurehead with strict laws and too many eyes and ears reporting back to him, and the self-granted right to change his mind as he pleases. Basically, Mildred is only there because she would probably be killed by the rebel army destroying homes on the outside of the Wall. After receiving a bit of criticism on the world building issues, I read a bit more with that in mind and realised that my world building is actually really terrible. I mean, thank goodness this is a first draft or I would probably just bash my head with a brick and have it done with. I'm hoping that with the fact it needs fixing in mind while I continue to edit, I'll be able to make this story a whole lot better. Which brings me to my next dilemma. At the moment, with the editing I have done so far to the first three or so chapters, and with a lack of world building throughout, 'WALLS' sits at 87,962 words. I wrote the initial 88-89K first draft in less than 40 days, but editing is a different story and that number is daunting. I'm trying to take things one chapter at a time for now, but even so, thinking how much work I'm about to have to do and how much longer it's going to get if I do it properly is actually really scary and I'm starting to have moments of self-doubt. Can I actually pull this off? Sure I can. At least, that's what I'm going to have to keep telling myself. And then the word count presents a second issue: how long is too long? Because once I do this world building properly, it's only going to be longer. I don't even know what genre I'm supposed to classify it as anymore and I've stopped telling the people who are reading it for me because I want them to tell ME where they think it belongs, because I'm afraid I'll put it in the wrong category. I mean, it's for older teens and young adults, and I've been told that a good length is about 60K... but then there's The Hunger Games. And I think 'WALLS' is a little (lot) more sinister at times than The Hunger Games. I just don't know. I've always been of the mindset that length doesn't matter: a story should be as long or as short as it needs to be, to be told well. This post has turned into a more of a venting/rambling train of thought which may or may not be coherent, so I'm going to cut myself off here and go to sleep. How do you find world building when you're working with an alternative universe? Do you end up doubting yourself even though you've already come so far? Is a word count important to a story? How do you decide what genre or category your writing belongs in? An awesome friend I made living on the residency at my university last year gifted this book to me for Christmas and I devoured it in the first couple of weeks of January. Taking this book on holiday with me when I went to the beach for a week with my boyfriends family was about as smart as reading Bridge to Terabithia on the train on my way to Melbourne a few months ago. 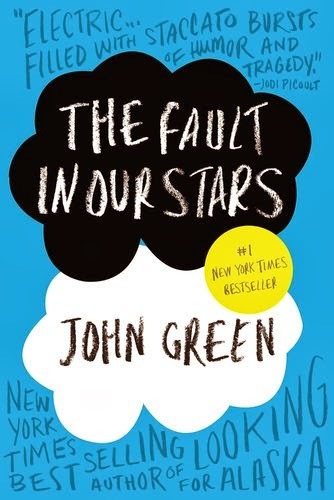 Augustus and Hazel are beautiful characters who I loved and hated and loved again while I read this book. Some of the things they say to each other are stupid and insensitive, but the two are just so perfectly, typically, teenager-y and human. If you've read so much as the blurb before you start the first chapter, you already know that Hazel is a terminal cancer patient, and her future looks glum from the very first page. Augustus shows up at support group one day and turns her world upside down very quickly. He is a survivor and an amputee, healthy, and single. Their story is so tragic, but not in the way you might have first expected when you started reading the book. My favourite part of the plot was Amsterdam. Hazel had wasted her wish on Disneyland when she was thirteen, pre-miracle, but Augustus still had his and decided to use it to take her to meet her favourite author of a book she had made him read, An Imperial Affliction. The trip isn't perfect and the author is an arse in person, but the intentions were so perfect and Gus was really sweet and I could gush about it all day, but let's move on. The majority of the story is set in Indiana, US. The worldbuilding tells us what we need to know, though I am wondering if the park they went to really exists, with the strange bones sculpture. What wasn't set in Indiana was set in Amsterdam, and it was lovely. Again, we were only told a few things, but Green set the scene and the mood for their overall stay with a few sweet descriptions (and the locals who thought their coupling was cute). While I found the style of Green's writing annoying at a few points, I have to commend him on his efforts. The reason his style annoyed me was because he had gotten into the head of a teenage girl who was for the most part, gushing over Gus or being moody or both, and he did an accurate job of portraying the inner thoughts and feelings in that way. The way she said, thought, and did things annoyed me because she was just such a typical teenage girl (I have to live with myself 24/7, so I know!) with dying of cancer on top of it all, so I guess it was more Hazel annoying me than Green's style. This book stands out from others because it rips your heart out over and over again and never quite lets you put it back in, even at the end. There is a fine balance between humour, romance, and tragedy, along with some dark philosophical thinking about life and death and dying that even made me the reader stop and have a think about things. This book is depressing and there is no happily ever after, even if it is a beautiful story from start to finish. It didn't reduce me to tears like a few people said it did for them, but it certainly struck a few chords and if I read it again I'd probably get a little closer to crying each time. Review reference credit again goes to Lynda R. Young. If you haven't read it, go on, do it. You know you secretly love feeling miserable because of the tragic lives of fictional characters. Greetings all! While those of you in the northern hemisphere shiver and rug up, my little part of Australia is experiencing a heatwave. We have had 40 degree days since Monday and the nights have not given much relieve. A storm swept through the region last night with not very much rain, but a few lightning strikes causing fires. Nothing of serious impact to me and my family at the moment though. I am staying cooped up in side to avoid the worst of the heat. The weather should cool down to the 20s over the weekend. Meanwhile, I've started doing a bit of editing on my first-draft for WALLS. Some awesome friends offered to workshop the first chapter for me and I've gotten some good feedback and helpful criticism. I might get chapter 2 edits underway later today. Characters: My favourite was Rorschach, because I always love the really messed up guys, especially when they're still the good guys despite all of that. While he presents the darkest point of view throughout the comic, the way he talks is sometimes also funny. I really enjoy the way he recounts things. My least favourite character would have to be Laurie Juspeczyk, the second-generation Silk Spectre, mostly because I found her to be an over-emotional strumpet. She just bugged me. Plot: It's a close one, but although Rorschach is my favourite character, Dr Manhattan's point of view is also amazing and I loved the part where he *SPOILER ALERT* went to Mars and was reflecting on his past, but how it wasn't his past because there is no such thing as past, present, and future, and everything is happening all at once. It's a confusing concept and I canNOT explain is sufficiently, but it was pretty cool. There were a few points during the story where I felt things moved a little too quickly and didn't delves into the details and reactions of characters enough after certain things happened, but aside from that it was pretty great storytelling. Setting: Alternate U.S as per the description in the summary. Considering how different they made it to what it really is, I think they did a brilliant job with world-building. Style: Being a comic, the majority of the writing was dialogue and it really helped me to get to know the characters. Each had a distinct way of talking, whether it be the words they used or didn't use or the sophistication of how they phrased things or the particular things they talked about. Originality: While I thought a couple of the ideas in the comic were a little bit far fetched, I cannot fault this comic on originality. This was a really different take on the world and good vs evil. An excellent read. Well, I think I managed to keep that relatively short considering it was meant to be a review, so now I'm going to write and continue to stay cool indoors. 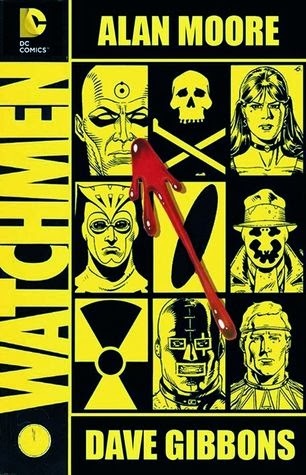 Have you read the Watchmen graphic novel? How is the weather where you are? P.S - due to some social pressures and a need to keep in contact with some otherwise uncontactable friends, I have created a Twitter and Tumblr account. Twitter is going to be mostly writing related micro-blogging and Tumblr is just whatever. Please see the Find Me page if you would like to follow me on either. I thought I'd give my blog a break from reviewing things for this post, although I have a couple of books to tell you about. Instead, I though I'd give a short post about what I am looking forward to this year. Last year, I set my reading goal through the Goodreads Reading Challenge for 24 books, because I don't believe I read nearly enough. I only managed to get 17 books finished last year and I was a little upset with myself. I've set my goal this year for 24 books again, and so far I've read two. I'm going to put a little more effort into it this year, because admittedly I was lazy in 2014. This year so far I have read The Fault in Our Stars by John Green and Quirky Tails by Paul Jennings, and I've started reading Of Mice and Men by John Steinbeck, which I hope to finish by tomorrow. Next on my list is A Clash of Kings the second book in the A Song of Ice and Fire series by George R. R. Martin. I'm sure I'll have to read a few books for university, which I am also looking forward to. Speaking of university, I am looking forward to all of my subjects. I am discontinuing Journalism as my minor study and picking up Children's Literature instead, which I think I'll be much better suited for. In Trimester 1, my subjects are Fiction Writing, Creative Non-Fiction, Poetry, and Literature for Children and Young Adults. In Trimester 2, I will be studying Editing and the Author, Power Politics and Texts for Young People, Philosophy Art Film, and Ethics in Global Society. It's scary to think that I'm already a third of the way through my undergraduate course and I'll only have one third to go after this year! I will also be working at the university's library this year, which I will happily count as industry experience. The Deakin Writers Club's magazine Wordly is continuing to grow and I am will be submitting as many pieces for consideration as possible as well as taking any other writerly opportunities the university offers, including submitting to the annual Verandah journal. And of course, I will be continuing to write my novels and edit them. Between KATHERINE and WALLS, I hope to spend a lot of time editing during the university trimesters and then participate in NaNoWriMo again come November. This post got longer than I wanted it to, so I'll shut up now. What are your writerly goals for 2014? I recently finished watching a great TV series, Breaking Bad, last week. Admittedly, I think I'm going to have to double back and re-watch season 1 to refresh myself, but in the past few months I have watched season 2 through to season 5. One of the things I loved most about this TV series is the tension. While the episodes are overall very serious and drawn out, I think this series gets away with it because of the high-intensity of the climaxes and the suspense that's left between them. There is a lot of character development that really lets you get to know the characters and their situations. My favourite character would have to be Jesse, even though half the time I really hate him. My first impression was that this kid is some dropkick little prick with no hope and no morals, but through watching the series and watching him develop as a character, we find out otherwise. Jesse has some serious internal conflicts, especially regarding murder and the involvement of children with the meth business and its repercussions. As far as the 'bad guys' go, I thought Gus was the best and most terrifying. At first, I thought he was actually a really nice, half-decent guy, but like all of the other characters, I quickly discovered that he was much more three-dimensional than that. I loved how they used the setting for the story, so that it was useful to what Jesse and Walt start off trying to do, so that it is useful for the hiding of money and burying of bodies throughout the seasons, and how it is close enough to Mexico for the drug cartel to be heavily involved. The ending of the series was amazing and I had no idea how it was going to end until it was over. I would have liked to have seen a little more of a reunion between Walt and Jesse, but I can understand why that didn't happen. The one thing I'm still not sure I was happy with was - spoiler alert - Hank's death. As much as I wanted Walt to escape and get away with everything, I really did want Hank to be the one to bring him in if it came to that. I guess he came pretty close before Todd's uncle showed up. I don't know, I just didn't feel like having Hank killed was the right decision for the series. Another thing I really loved about this TV series is that you know that what Walt is doing is wrong, but you still want him to succeed, because he is the main character and you understand him and you can sympathise with him. You could almost let yourself believe he is doing the right thing after all. As a fan of DeathNote I drew a few comparisons to the ending of that series, which also had a 'bad guy' for a protagonist. Overall, I thought it was brilliant. I was hanging off the edge of my seat every episode, wondering what would happen next. And here is the trailer to the second half of season 5, in which Bryan Cranston recites the poem Ozymandias by Percy Bysshe Shelley. Speaking of Ozymandias, I finished reading the graphic novel of The Watchmen on New Year's Eve, so I'll be posting a review of that soon, too. Happy New Year, everyone. Have you seen Breaking Bad? What were your thoughts?